The military death toll from the Sinai Wednesday attack has reached 21, health minister spokesperson Hossam Abdel-Ghaffar confirmed to Ahram Online on Saturday. Simultaneous attacks on military checkpoints on Wednesday, claimed by Islamist militant group Ansar Beit Al-Maqdis (ABM) were initially said to have claimed the lives of 17 military personnel, according to official statements by the Egyptian armed forces. Also, 100 militants were announced dead. The Egyptian army on Saturday announced that it had carried out an offensive on militant hideouts in the restive North Sinai governorate over the past three days, resulting in the death of 205 more militants. In November, ABM, which has announced its responsibility for most of the major attacks in Egypt, claimed allegiance to the Islamic State militant group currently controlling swathes of Syria and Iraq. 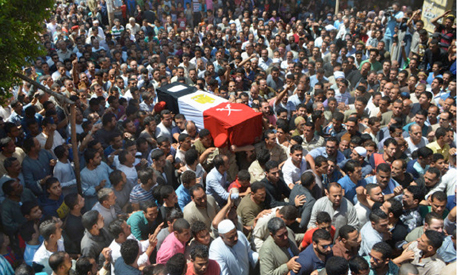 Militants have killed hundreds of police and army personnel in North Sinai over the past two years.